Hot off the plane From Pakistan! What an adventure! It’s my privilege to share it with you here on Gateway News. 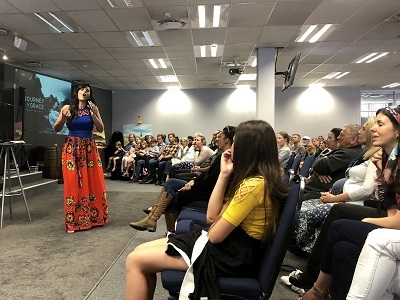 God is looking all around the world for someone who will say: “Here I am Lord, send me!” Both God and I took it literally and so I “go into all the world” to fulfil the Great Commission. If you love the go of the Gospel — you are going to LOVE LOVE LOVE these testimonies. 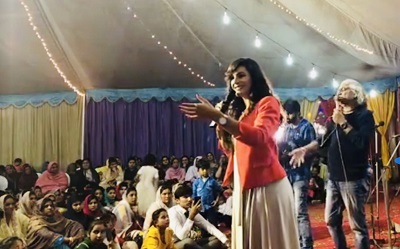 The month included ministering in George, Jeffreys Bay, Cape Town, Bloemfontein, Paarl and of course Pakistan! And that’s what it was — passionate! 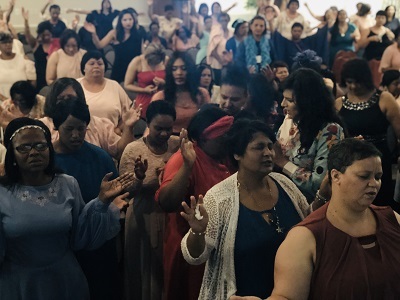 God moved mightily among these 250 women! God did many miracles among us this night. A lady who has had tinnitus for 20 years stood crying as she came into the realisation that the ringing is really really gone! 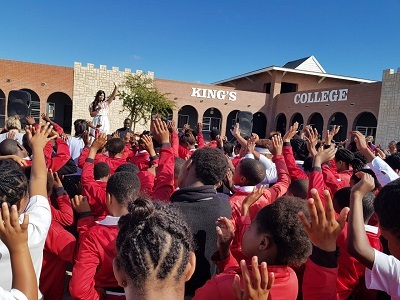 A Christian initiative in the township to raise King’s kids! And the King Himself visited us! Hundreds saved and weeping in the glorious presence of the Holy Spirit. Being able to preach at my home church is always a blast! The altar was lined up at the call for salvations. The first person to jump at the invitation to accept Jesus as Lord was a man who had been following me on Facebook and had not been to church in years! Wonderful! 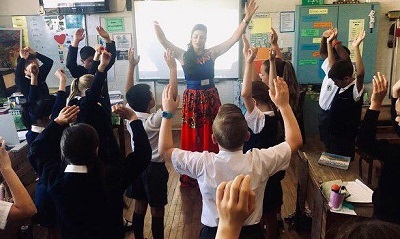 Two days , six classes –half-hour sessions each! I would then tell them about John 16:7 where Jesus said He is sending us something better in His place — the Holy Spirit. We would all put our hands up and ask Holy Spirit to baptise us. 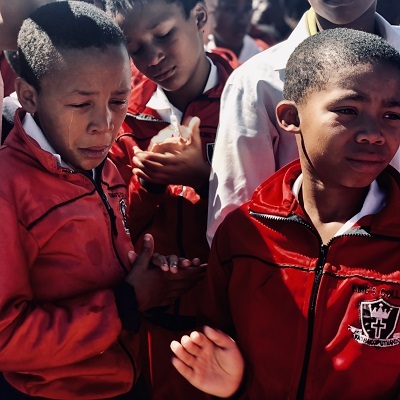 Suddenly a young boy exclaims whilst moving his neck: “Mam I am healed!” and many followed. It happened in every class! As we asked the Spirit of God to come, the kids were healed all around the room. I didn’t even pray for healing, but where the Spirit of the Lord is there is freedom! I don’t know if I have ever seen miracles break out by themselves so easily and in such high numbers! Hallelujah! In one class of 35 kids, 34 were healed — scars closed up, backs, necks, knees, eyesight and more! One boy started to weep as he realised his asthma, which had been causing a tight chest, was gone! A glorious weekend in Bloem. Three meetings, great salvations, healings and deliverances! Even our waitress’s deaf ear popped open! Listen to the testimonies from the weekend, just before I climbed on the plane! The Wednesday evening I ministered to Christians in the medical field. It was great! I released courage and endurance — “Do not give up!” and then prayed for the sick. 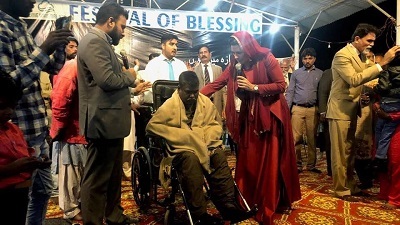 There was a man in a wheelchair and he had a tremendous breakthrough in his one leg which was not moving well at all! His chiropractor was there and she confirmed it! Wow! Glory to God. The next morning I was up early to pack for my flight. It had finally arrived. The trip God had given me dreams about. 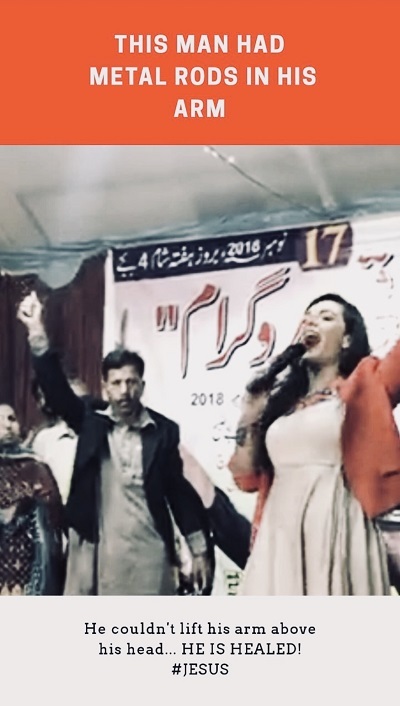 It was a crazy time to go, to say the least, because of all the rage and protests around a Christian Pakistani Women who the Muslims wanted executed. Here was another Christian women coming on her own at the same time as the uproar to preach the Gospel of the Messiah Jesus Christ at crusades! But God spoke so clearly I had no doubt about the mission and it’s timing and therefore I had no fear. It was GLORIOUS! Difficult too, but amazing! 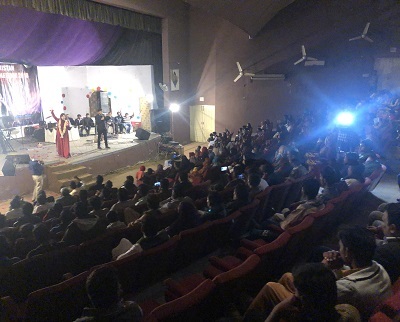 This was our first meeting – in a marriage hall! 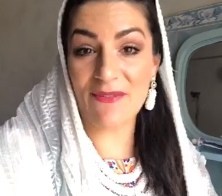 Metal dissolved, the deaf heard, the blind saw, the lost were saved, the demonised delivered, people walked that couldn’t before, a Muslim almost at the end of his life, lying on a bed in the road, was saved and healed!!! So many glorious things! Big meetings and small meetings and one-on-ones! We did it. A few testimonies — wow there were so many more! This one I shared the day before heading back to SA. So good, MUST WATCH! If you want to hear and see more you can have look at our social media pages for wonderful clips and testimonies! … to everyone who gave and who prayed! Just before leaving for Pakistan I received fantastic news! Beautiful Witness Ministries biggest donation ever!!! As I woke up to prepare to go the elementary schools the week before leaving for the trip I received a message: R80 000 donation!!! Finally my Pakistan trip was covered! Glory to God we could have the bigger meetings and visit more cities! Seven cities in 10 days! Boom! 1 000’s saved! Your financial breakthrough is on its way! Don’t give up on Our Provider, Jehohav Jire. So thankful for EVERY donation big and small. God bless you richly! I pray you have been inspired through these testimonies to be a witness of the beautiful gospel RIGHT WHERE YOU ARE! Not all of us have been called by God to get on a plane and go to a faraway land, BUT all of us have been called to walk like Jesus!